A Milwaukee driver who was shot at during and attempted robbery, is speaking out. 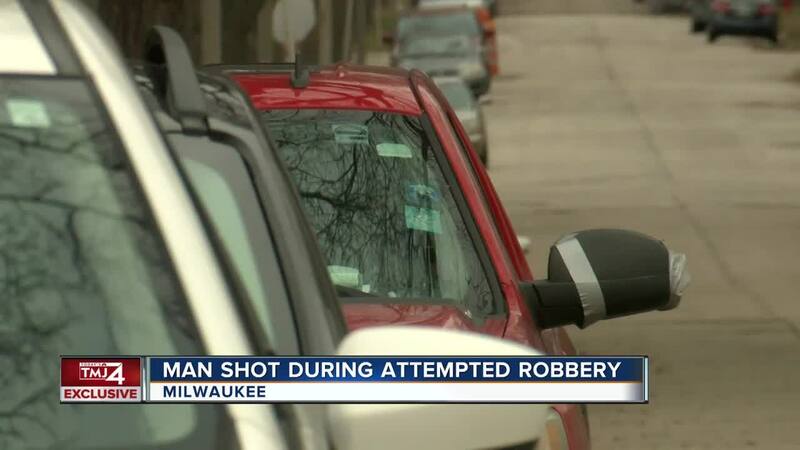 MILWAUKEE -- A Milwaukee driver who was shot at during an attempted robbery is speaking out. His passenger was struck by gunfire and rushed to the hospital. The attempted robbery happened just off the busy intersection of N. 50th and Capitol. Kenneth Lyons, 24, says he parked on the side of the road at about 11 p.m. Monday, when the suspect approached his car. Lyons described how the suspect walked up to talk to his friend who was sitting in his passenger seat. "He looked back like, 'Do I know you?' [The suspect replied] 'Yeah you know me' and he grabbed him and when he grabbed him he pulled out the gun as soon as I saw the gun I hit the gas," said Lyons. Lyons says he ducked down as he sped away. That's when he hit a parked vehicle about 20 feet away and flipped his car. Milwaukee Police rushed his friend to the hospital when they discovered he had been shot. Lyons had a cut lip. He hopes the gunman is found, "It's sad that you can't sit in a car and chill for 20-30 minutes without being injured, or hurt or dead!"